This security poster illustrates the UMP-1 Fuze Yugoslavia Initiator. This initiator is a simple pull fuzed designated as Type 1 and designed for use with booby trap devices. This security poster features the function of the UMP-1, the critical clearance between pull pin head and fuze body, and the UMP-1 being fitted to a TMA-3 anti-tank mine with anti-lift fuze well in the bottom. This security poster illustrates how the safety pin cannot be replaced and how the fuze is comprised of the fuze body, the pull pin, the striker, and the safety pin. The function of the UMP-1. How the safety pin cannot be replaced. The critical clearance between pull pin head and fuze body. The UMP-1 being fitted to a TMA-3 anti-tank mine with anti-lift fuze well in the bottom. That the fuze is comprised of the fuze body, the pull pin, the striker, and the safety pin. 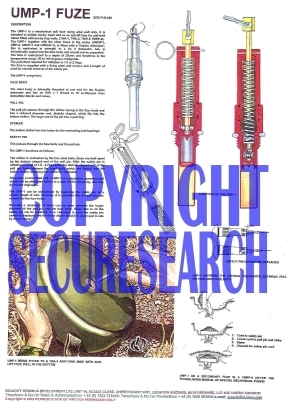 This security poster features the function of the UMP-1, the critical clearance between pull pin head and fuze body, and the UMP-1 being fitted to a TMA-3 anti-tank mine with anti-lift fuze well in the bottom.